EOS - European Organisation of the Sawmill Industry | News - Walk in the park and learn about why using wood! Walk in the park and learn about why using wood! In connection with the celebration for the World Environment Day (on 5th June) under the theme of "connecting People with Nature", the United Nations and other Forest City Project partners, including EOS, held an exhibition in the Park Cinquantenaire, green heart of the European Quarter. 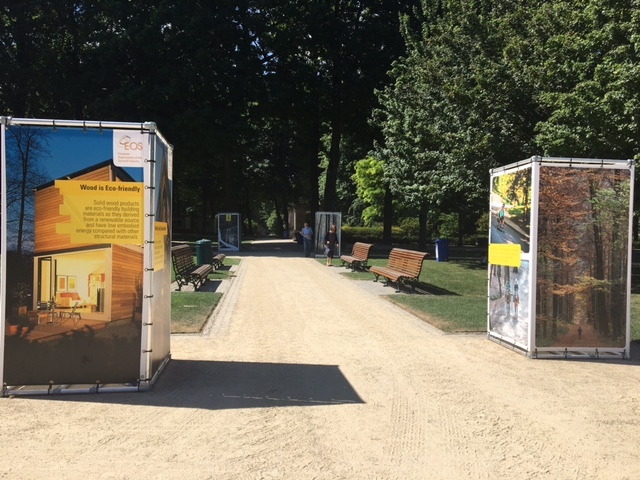 Encouraging citizens to reconnect with nature, the Forest City Project includes an outdoor photo exhibition with photography by Michel Petillo of the Sonian Forest around Brussels and images from the Carnegie Airborne Observatory (CAO) at Stanford University. The EOS cube, displacing messages on the contribution of wood in tackling climate change was part of this exhibition. In the picture, the EOS cube.